When I first started my blogging business, I was easily able to write new articles, comment on other blogs, manage my social media clients, and answer emails, all while enjoying a cup of coffee when my daughter was napping. But as time went on my business and responsibilities grew, and email started to consume my life. It seemed like it was taking me hours upon hours, each and every day to make a dent in my inbox. No matter if you’re a blogger, small business owner, or direct sales consultant, as your business grows, your inbox will become an overwhelming task in your day-to-day routine. In fact, when I talk to small business owners, email overload seems to be an all too common theme. 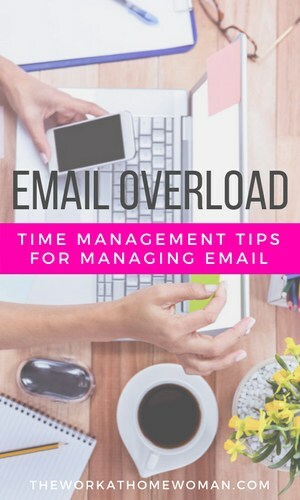 Here are tips for managing email, that will save you time, and help you conquer email overload. If you keep your email open all day long, every time you get a new email, you’ll be distracted from what you’re currently doing. Letting email distract you all day long, is a HUGE time waster, not to mention that it is controlling how you work. Schedule one to three times each day to answer emails, when your allotted time is up, close it down. To keep your clients in the loop, communicate with them, and let them know what your hours are for answering emails. You can do this by adding an auto-responder, via your email signature or on your website's contact page. Wouldn't it be nice to have an assistant that screened and sorted your emails by the level of priority? Now you can. SaneBox is a virtual platform that analyzes and learns your email habits and then filters your email — so only important emails end up in your inbox (which majorly cuts down on email distractions). 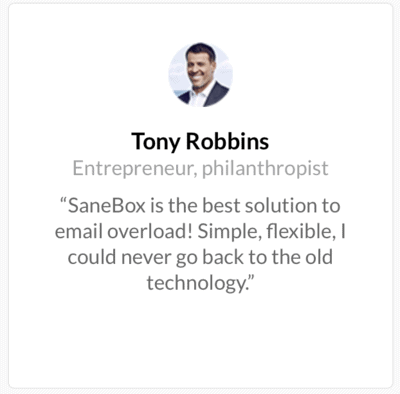 Besides automatically cleaning up your inbox, SaneBox creates a daily digest that summarizes your unread and unimportant email activity, which you can quickly process or send to your virtual assistant to process the unimportant email for you. You can try SaneBox free for 14-days, and then after that, it's $7 a month for the snack plan. According to their website, “The average SaneBox customer saves 100+ hours a year using their service.” — which is pretty incredible! I've partnered with SaneBox to bring you an exclusive $25 credit for all new sign ups, just sign up through this link. I got this strategy from a post that James Clear wrote about procrastination. The article states that if a task will take two minutes or less, go ahead and get it out of the way — which this strategy works great for email. The idea is behind this rule is once you start the action, you build momentum, and you eventually create a habit. So, in regards to email, if it will take two minutes or less to answer, do it, and get it out of your inbox. One of the many reasons inboxes become so inundated with emails is that we don’t have the proper organizational systems in place to manage messages. I personally have over 100 different folders for keeping track of messages and correspondence with clients. If you're new to this type of system, start off by creating a Follow-Up Folder, a Hold Folder, and an Archive Folder. Having these three folders in place will allow you to clear out your inbox and manage your messages more effectively. As time goes on, you'll be able to more clearly see what types of folder make sense for your business. How much time do you spend deleting unwanted emails from subscriptions that you’ve outgrown, no longer need, or have been automatically been signed up for? Take an extra minute and go through your newsletter subscriptions and unsubscribe yourself. Most companies have made the process relatively easy and it takes just a few seconds to complete. If you're using SaneBox you can use their SaneBlackHole feature which unsubscribes you from mailing lists and individual senders by placing the email in the SaneBlackHole folder. Going forward the system will automatically remove these messages for you and you'll never have to deal with them again. Don’t worry about crafting the perfect reply, just keep your emails short, sweet, and concise. Along with this remember to craft a descriptive subject line that will help the individual determine what your email is about (this will help with getting quicker replies too). Example: “Question – About Advertising Prices”. If you’re needing to explain something in detail, where there could easily be a miscommunication, pick up the phone and give the individual a call. Sometimes email isn’t the best tool for the job. No matter what your business is, there are most likely going to be questions that you get asked over and over again. There are a couple of ways to solve this problem. One you can create an FAQ (frequently asked questions) section on your website. Secondly, you can craft a template of responses that can be easily copied and pasted into the body if an email. By taking some time on the front end, you can save yourself loads of time on the back end. Need help crafting professional responses? Michael Hyatt has some great email templates for saying no. Often we are in such a hurry to get things done, that we end up skimming over emails and missing important details. Slow down and read the email in its entirety. Many times just by taking a few extra minutes to read thoroughly, misunderstandings can be cleared up, replies can be sent with a more focused answer, and you save time by following directions. Since you're sending hundreds of emails each week, why not convey important information via your email signature? It takes just a few minutes to set up a well thought out email signature, and once it's in place, it can help cut down unnecessary emails by alerting individuals of important information. I personally like to include my office hours, so individuals can see exactly when I'm in the office and when I'm not. Adding vacation dates in advance can help prepare individuals for your departure, or you can include a link to your appointment scheduling software. The options are truly endless. Need help crafting a good email signature? This post covers exactly what you need to have. With any good plan, it takes a few weeks to make the changes a habit. But once you start taking control of your email, you will gradually notice an increase in your productivity. 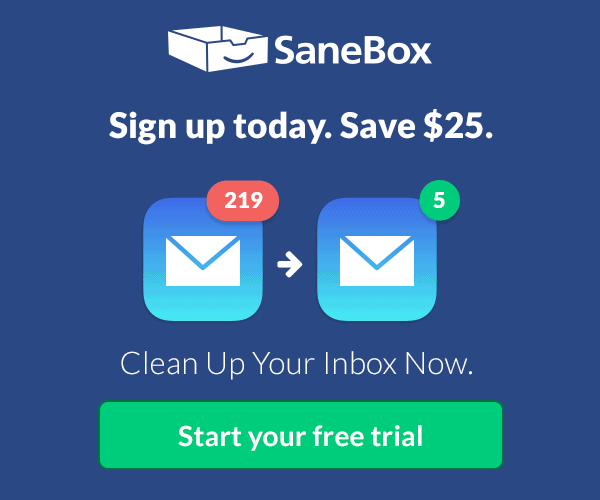 Get a $25 credit towards any SaneBox subscription — click here. Originally published April 27, 2012. Updated April 3, 2017. This post was sponsored by SaneBox. Please be aware we only promote advertising from companies that we feel we can legitimately recommend to our readers. See our disclosure policy for further information. These tips are just what I need! I especially like the two-minute rule; sometimes I spend too much time mulling over emails that I don’t realize it steals time from other tasks. Filtering the emails helps a lot. I use a different account for my subscriptions, which I schedule to check only twice weekly. For the work-related or blog-contact form emails, I use my main account. It’s easier to filter them this way, because I tend to get distracted by subscriptions. I also edit my subscription list from time to time. I also prioritize emails according to urgency, like you have done. Lastly, since I stlll use Gmail (not for long, will be getting a proper, custom-domain email address), I turn off those desktop notifications, so I’m not tempted to check emails when I’m working. That’s a great idea Martine, to have a separate account for subscriptions!